So you need some golf gift bag ideas? Well you’ve come to the right place. I run a golf course in Virginia, so I have a few golf gift bag insights that you can steal for your next event. See my golf goodie bag ideas below. Let’s face it, the size of the bag you give golfers will make an instant psychological impression. You can build a golf gift package that costs $100, but if the bag is 4 inches by 4 inches, golfers may think they’re getting a cheap bag of trinkets. If you’re hosting a golf event, you want to build a bag to impress. My suggestion is to choose a bag or a box that screams quality. Take a look at some sample bags and boxes from BagsandBowsOnline or another retailer (I recommend Bags and Bows because I’ve purchased from them before). Make sure your box or bag is at least 8″ wide so you have plenty of room to arrange your items. You can have most of these bags hot stamped or imprinted. Explore customization options for an added touch of elegance. If you purchase through BagsandBowsOnline, use the promo code AFF15 (automatically applied if you click here) to save 15% on your purchase. In this bag, your goal is to give golfers some items that they can put to use. Here are some items to consider. These are some of the best-reviewed golf tees on the web. This bag of tees is 8″ wide, so it will do a good job of filling your bag and leaving golfers with something they will definitely use. If $6.99 a bag is too much money to invest in one golf gift bag, you could buy the larger bag of tees ($9 or so for 135 tees) and split those tees between three or four gift bags. This would help you cut costs while still filling a good chunk of space. The towels themselves are available in many different colors, so you could choose to coordinate with your event or company colors as well. This duo does a great job filling space in each golf gift bag. Serious golfers are always looking for opportunities to practice, and more casual golfers will benefit from a set of practice balls. This bag includes a dozen orange plastic balls that will simulate the flight of an actual golf ball. Perfect for practicing in the yard or other places where space is limited. This is a nice cheap gift bag addition that will feel space in your bag and is backed by plenty of positive reviews on Amazon (4.5/5 stars). Don’t underestimate the importance of a snack. Golfers spend time getting on/off the golf cart while stepping in/out of the sun. Cliff Energy Bars are non-GMO, packed with protein, and made with organic oats. If there are health-conscious golfers in your group, they’ll be happy too. Chocolate chip cookie seems like a safe flavor for most audiences. Other snack possibilities include a candy bar, peanuts, sunflower seeds, etc…basically whatever you could imagine golfers snacking on. What golf gift bag would be complete without some actual golf balls? Some golfers are real particular about what type of ball they use, so my advice is to pick a less expensive golf ball (Wilson balls are usually nice and affordable) to include in the bag. If a golfer doesn’t “like” the balls you’ve included, they can always regift to a niece, nephew, or friend. Most picky golfers will save cheaper balls for shots with significant water hazards. Stay away from refurbished balls only because they’ll make you look cheap. The quality of most refurbished golf balls is comparable to those of new balls, but it’s best to stick with new balls in a gift bag. In this bag, your goal is to give golfers some unique golf-related items. These are “fun” items that people will make people smile or set your bag apart from a typical golf gift bag. Some consider these balls to be one of the best golf gag gifts around. When a golfer hits an exploding golf ball, it vanishes into thin air. Golfers will have fun pranking friends on the course and will enjoy adding this timeless prank to their repertoire. To save money, you could split the 3 pack and just put one exploding golf ball in each bag. Golf and alcohol go hand in hand for some, so this mini drinking flask will be well-received for both its functional and humorous value. Worried about non-drinkers? They can use the flask to store an essential sip of water for those extra hot days. Who knows? A little sip of water could save their life. This is a nice addition to a golfer’s accessory lineup, and it clips conveniently to a belt buckle or golf bag. Most golfers know a few wagering games that they play with friends on the course. However, those games can get old…especially if you always lose them. This book helps expand a golfer’s creativity with new games and formats they can try with friends during their next round. Golf Games is well-organized and offers suggestions for both large and small groups. With it’s 8 inch height, it will add a nice “backbone” to your golf gift bag. Golfers use standard golf tees because they are cheap, not because they are the best. 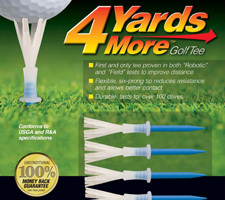 The 4 Yards More Golf Tee goes way beyond the standard tee. This gift bag addition will set you apart from the crowd and pique the interest of some golfers because most haven’t tried this unconventional tee. Since golfers are always looking for ways to hit the ball further, they’ll be excited to add these tees to their artillery and test the “4 Yards More” claim. These golf balls are an awesome gift. Each golf ball is impact activated, so if a golfer drops it on the ground or hits it with a club, the internal LED lights are activated, along with a 10 minute timer. These balls glow super-bright, allowing golfers to finish a round that’s gone later in the day than expected OR take to the course late at night. Color options include white, green, blue, red, yellow, and pink. 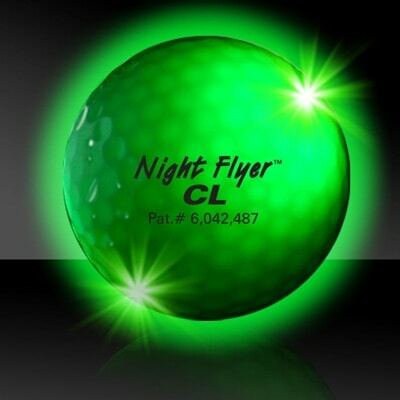 A big upgrade from the old glow stick night golf balls and a great novelty addition to your golf gift bag. A nice filler for your golf gift bag. 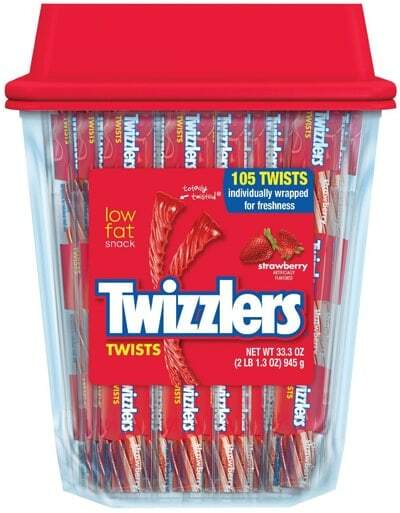 You can buy a case of 105 Twizzlers for about 5 dollars. Most people enjoy Twizzlers, so I think it’s a wise gift bag addition. With the 8″ height of these snacks, you can throw 4-5 in each bag and they’ll add real substance. Here are my favorite places to look for good closeout or clearance deals for your golf goodie bag. These are also great places to find tournament prizes. I’ve tried to give you a good starting point for golf gift bag ideas. Please share your golf gift bag ideas in the comments section below.